I couldn't have been more excited for the release of Casey and Blake's HEA! If there was a couple who ever truly deserved a book dedicated solely to happiness and love it would be the two of them. Bait, book 1, took us on such a roller coaster that by the end of it, not only was I dying to see where the story would go but I was emotionally exhausted. I felt strung out, but I LOVED every minute of that book. Sail, while good, felt really strung out and a little slow to me, but Anchor absolutely blew me away exceeding every single one of my expectations. I'm not sure a better conclusion to a trilogy has ever been written. That's not an exaggeration either, this book is simply that good. Author M. Mabie goes above and beyond in Wake. She answers every single one of our questions, and leaves us with an epilogue that honestly may be the most perfect thing I have every read. Wake picks up post Blake's accident, so what is going to happen? What kind of fall out will this couple have to deal with and how will it affect their relationship? Will the stars finally align? Obviously yes they do and the journey taking us there is magnificent. Off the charts chemistry, playful banter, love, devotion and determination, all are a great way to describe Casey and Blake's relationship. 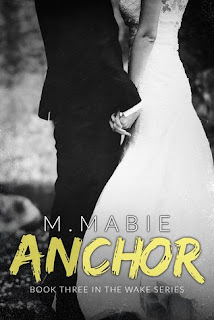 These two have had one hell of a fight, but love isn't supposed to be easy and the journey itself is oftentimes what cements a strong deep love and connection between two people and M. Mabie has captured this essence brilliantly, she absolutely nailed it! This series and these characters demand every ounce of you attention and their story will stay with you long after the final pages are turned. I love how M. Mabie fed us just enough tidbits to pique our interest into hopefully another book for some of the secondary characters in this series. I for one am truly looking forward to seeing what M. Mabie has up her sleeve.